Charcoal, currently one of the most talked about ingredients out there! Charcoal has become mainstream in masks, toothpaste and even deodorant! Yet the question that I am regularly asked is, does it really work?! The answer is simple, yes it really does! Charcoal is known for its detoxifying properties both on the inside of the body and out. Activated charcoal helps to bind toxins and makes it much easier for us to remove them from out bodies. Whether you are brushing your teeth, washing your face, or dealing with an upset stomach, activated charcoal is hard at work. 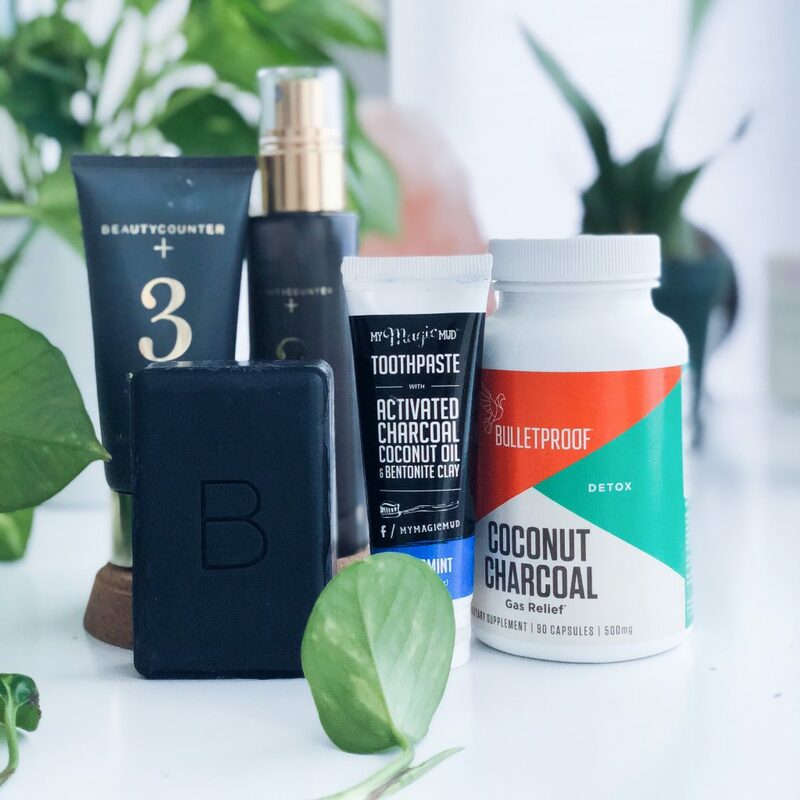 There are SO many charcoal products our there, and as always I recommend reading the ingredients, checking them against EWG’s Skin Deep Database, and making sure the ingredients are not on the “Never List”. 1.) Bulletproof Coconut Charcoal Caps, these are great for an upset stomach, bloating, gas, food poisoning and even E. Coli. Going out with the girls and planning to have a few drinks?! Pop a couple of these ahead of time to avoid a hang over! Charcoal is even given to patients in the ER when they have consumed something that is poisonous. Activated Charcoal binds to the toxins and the body is able to eliminate them. You can buy them locally at Eco Chic here or you can also find them here. 2.) Beautycounter Charcoal Cleansing Bar. This bar of soap is great for your face, back and bod. The charcoal is great for daily acne, weekly detox, or after contamination with things like smoke or smog. This bar will last 6-12 months, depending on how often you use it. I would recommend keeping it in a dry place such as a medicine cabinet vs the soap dish in your shower. This product is EWG verified and is only rated a 1! You can support my Beautycounter business and purchase here. 3.) My Magic Mud Tooth Paste. (How cute is this travel size?! However I would recommend buying the full size!) Activated Charcoal helps to freshen breath, fight plaque and and whiten teeth! I use to be a MAJOR teeth whitener (before I knew any better.) My teeth started to turn translucent! They also became very sensitive to cold and heat. Since switching to activated charcoal tooth paste, my teeth are whiter, my breath is fresher and they are no longer sensitive! You can purchase locally from Eco Chic here or you can find them here. 4.) Beautycounter Charcoal Mask. This is definitely one of my favorite charcoal products. As the mask dries, you can actually see the oil being pulled out of the skin! Be sure to follow me on Instagram for behind the scene photos of this charcoal mask. This product can be used once a week for acne prone skin, once a month for hormonal breakouts, or spot treat stubborn zits! This product is EWG verified and is only rated a 2! You can purchase here and support my Beautycounter business. 5.) Beautycounter Balancing Mist, this mist contains charcoal, rosemary and peppermint. These ingredients all help to balance the skin, fight acne and dry up oil. This mist can be used as a toner after a mask or daily wash. It can also be used to set and freshen up make up! You can support my Beautycounter business by shopping here. I hope that you find this helpful! As always do your own research, and really know the products and brands that you are using! If you would like to try a sample of any of the Beautycounter products listed above, please send me an email at rebekahsbeautycounter@gmail.com or send me a DM on Instagram.